In Balanced Achievement’s ‘Quote 20’ series, we illuminate 20 quotes about a particular topic or 20 quotes said by a prominent individual, all of which are chosen with hopes of increasing readers levels of inspiration and motivation. In this article, we turn our attention to the some of Hinduism’s most important spiritual scriptures by exploring 20 wisdom filled quotes from the Upanishads. Throughout the enchanting lands of India, a variety of ancient spiritual scriptures are cherished by those of the Hindu faith. While the Vedas are considered to be the foundational texts of the world’s oldest religion, and the inspirational epics, the Ramayana and Mahabharata, are held closest to most Hindus hearts, neither can match the transcendental wisdom of the Upanishads. Within this iconic collection of texts, readers are presented with the basic principles of what the iconic English author Aldous Huxley describes as the Perennial Philosophy that acts as the wellspring of all religious faith. It is believed that the Upanishads, which translates to mean ‘sitting down near’ in reference to a student sitting to receive spiritual knowledge from a teacher, were written between the years 800 B.C.E. and 500 B.C.E. as an important societal transformation was taking place. Up until this point in India’s history, the traditional Vedic religious order determined societal roles and the Brahmins, or priesthood caste, were the only ones allowed to partake in spiritual practices. This, however, changed when seemingly ordinary individuals shifted their focus from worldly aims to spiritual aspirations and transformed themselves into the sages who’s work is featured in the Upanishads. 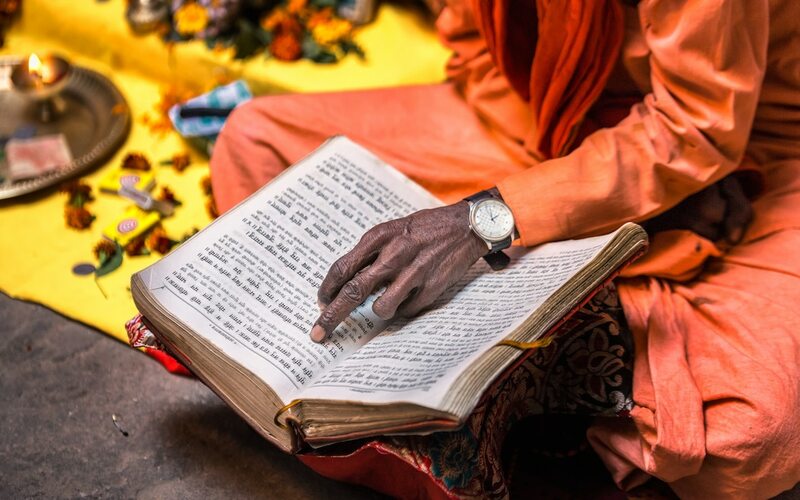 It’s for these reasons that the sacred scriptures are also referred to as Vedanta, one of the six primary schools of Hindu philosophy, which translates to mean ‘the end’ or ‘the last chapter’ of the Vedas.